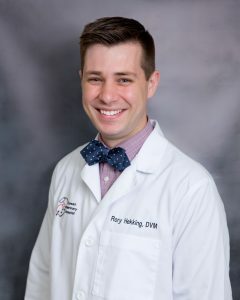 Dr. Hekking grew up playing in the creeks of Virginia, catching crayfish, salamanders, and anything else that crossed his path (including a snapping turtle!). He didn’t realize the depth of his connection to animals until his dog, Sable, passed away suddenly while in high school. It was at that time that he dedicated himself to helping owners and pets develop their special connection and to keep it going as long as possible. He has developed special interests in dental health and caring for senior pets. Dr. Hekking became a die-hard fan of Brigham Young University while earning his undergraduate degree from the school. After graduation he moved across the country back to Virginia to get his veterinary degree from Virginia Tech. He has been in Georgia ever since he graduated and loves spending time both in the city and the mountains with his wife, two daughters, and spaniel mix, Olive. In his free time you will catch him absorbing any and all sports, fishing, and playing with his family. 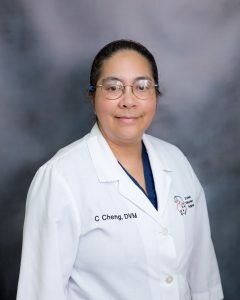 Dr. Cheng wanted to be a veterinarian since she was a little girl growing up in Norfolk, Virginia. While growing up her cat passed away from a disease that could have been prevented with a vaccine. Unfortunately, her family was never even offered the vaccine. It was at that time that Dr. Cheng decided she wanted to become a veterinarian so that other pet owners didn’t have to deal with the same heartache. 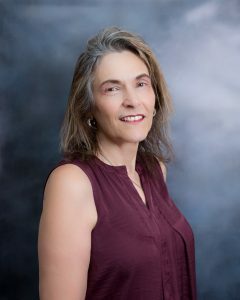 She attended Virginia Tech for her undergrad and earned her DVM from the University of Georgia. She liked Georgia so much, she decided to stick around. 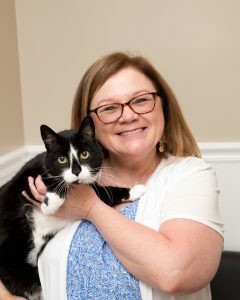 Since then she has been with Etowah Veterinary Hospital for over 30 years and developed special interests in surgery and preventative healthcare. She is dedicated to ensuring her patients are offered the highest level of care to ensure her patients live a long, happy life. Dr. Cheng treats her patients with lots of love and cares for them as if they were her own. Dr. Cheng has a cat, Shorty, and enjoys spending time with her husband Paul. In her time away from the clinic you will often find her on the water kayaking or walking around some of the local botanical gardens. She is also an avid sports fan, outdoor photographer, and reader. Mandy’s warm, welcoming, and bubbly personality will greet you the moment you walk through the door. 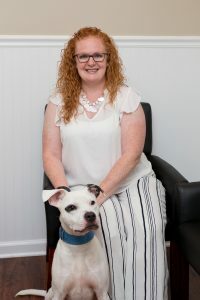 She has been helping our clients with anything they need for almost 15 years now! She is a born and bred Georgian, living in Decatur, Kennesaw, and now Woodstock. Outside of work, Mandy is a wonderful wife, mother, and Nana. She’s also got a houseful of two-legged, four-legged, and flippered friends. Her 4 dogs, 2 cats, 1 snake, fish, and backyard chickens keep her busy and entertained all the time. When she gets a break, she loves camping, boating and going to the beach. After retiring from a 30-year teaching career, Lisa joined the EVH family in 2017. She finds working at Etowah Veterinary Hospital the perfect fit for her skills and her love of animals. She is an animal advocate, having volunteered in the past with 2 local rescues. She actively helps with local & national rescue transport organizations. In addition to animal advocacy, Lisa has a varied assortment of interests. She can be found hanging out with fellow nerds at Dragon*Con every Labor Day weekend, and there’s not much that can drag her away from reading a good fantasy, sci-fi, or mystery novel while snuggling with a kitty! She enjoys country music concerts, traveling with her friends, and Georgia football. Go Dawgs! Brianna’s compassion for animals is evident the moment one meets her. Her greeting smile and quiet confidence instills a calm for both pets and parents. Born in Reno, Nevada, Brianna moved to Mérida, Yucatán Mexico at a very young age. She cared for many pets throughout her childhood and recognized the satisfaction that came from ensuring their health and well-being. She & her husband both studied veterinary medicine at the Universidad Autónoma de Yucatán and are licensed veterinarians in Mexico. Outside of the hospital, Brianna enjoys hiking or biking with her husband where they can discover new and beautiful places. She enjoys traveling, but is just as comfortable hanging out at home reading, watching movies, or playing video games. Tammy started working at Etowah Veterinary Hospital as the Humane Resource Manager in 1998. During her free time she enjoys spending time with her husband; traveling, riding motorcycles, and scuba diving. She has one daughter, two step sons, and two grandchildren. She also have a Boston Terrier mix named Lucy and a cat named Simon. Frankie started working for Etowah Veterinary Hospital as the Inventory Manager in January 2015. She has two boys, Jake and Chase, and a crazy Shiba Inu named Tucker. In her free time she enjoys spending time with family and friends, watching movies and being outside. Larry has been doing contract work for our practice since 2010 and recently joined us as a full-time employee.